Are you making any New Year’s resolutions? 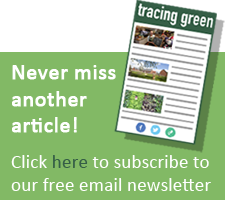 Cutting your meat consumption is the easiest way to reduce your impact on the environment. 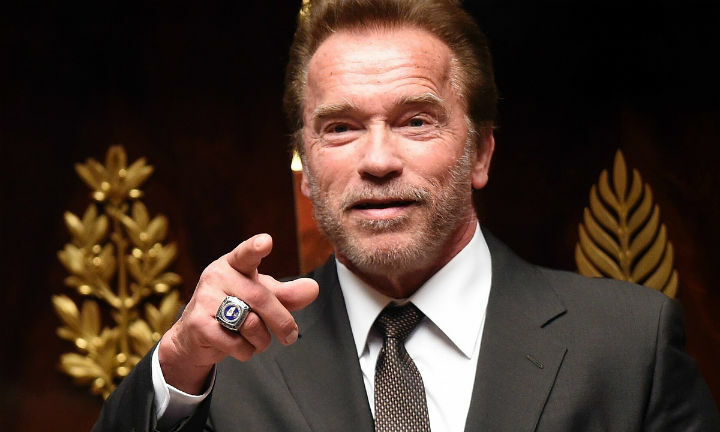 Arnie proposes giving up meat one or two days a week. However, the recent feature-length documentary Cowspiracy makes a convincing case for avoiding meat altogether. It claims that animal agriculture is the leading cause of environmental degradation, and the number one contributor to human caused climate change. The meat industry causes more GHG emissions than all forms of transport put together, including aviation, and this is before account is taken of deforestation. Rather than fretting over cycling instead of driving, we can have a significant and immediate impact by cutting down on meat. 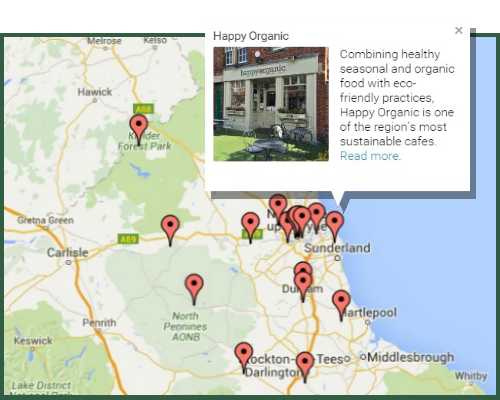 Louise promotes a ‘flexitarian’ diet, where people choose to consume less meat for the health of the planet as well as their ownOne North East company has been at the forefront of sustainable food for decades. I’ve eaten Quorn products for years but only recently did I realise they’re made here on Teeside. This week I met up with Quorn Food’s Environment and Sustainability Manager Louise Needham at their Stokesley factory in North Yorkshire. She was quick to point out that the company isn’t anti-meat. Rather, their mission has always been to help consumers to eat less meat. Like Arnie, Louise promotes what she calls a ‘flexitarian’ diet, where people choose to consume less meat for the health of the planet as well as their own. In fact, 70% of Quorn consumers are meat eaters. Quorn dates back to the 1960’s when there was a genuine concern about our ability to feed the world. Founder, Lord Rank, set out to discover a way to convert carbohydrates into proteins. Finally, a small fungi was discovered that could do just that. 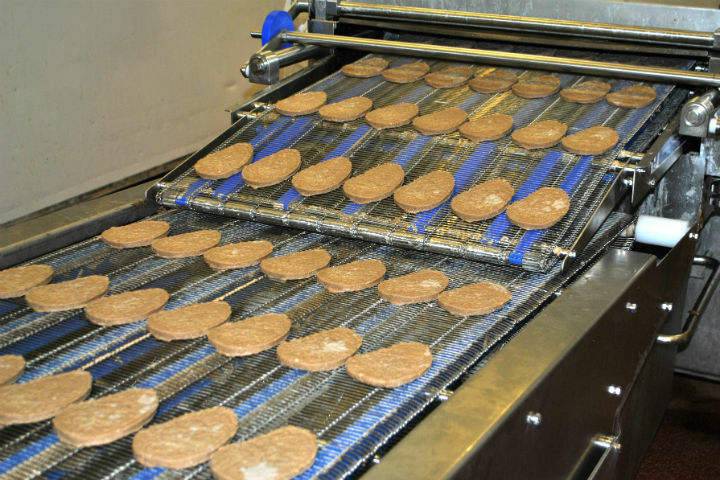 Through a fermentation process in their Belasis plant in Billingham, Quorn uses this fungi to convert wheat-derived carbs into a mycoprotein which can replicate the taste and texture of meat. I once served up a Quorn-based spaghetti bolognaise to my step-father who didn’t notice the difference. When I confessed, he was horrified, and accused me of feeding him processed food! Well it’s only as processed as yoghurt or beer, and it’s hardly as if factory farming is ‘natural’, despite such intensive methods giving us 80% of our meat. 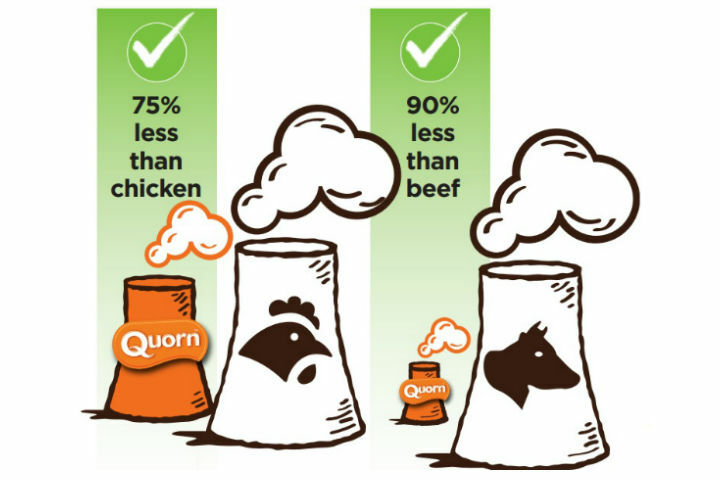 Quorn has a 75% lower carbon footprint than chicken, and 90% lower than beef.Quorn products have been on supermarket shelves since 1985 but in recent years the business has boomed. 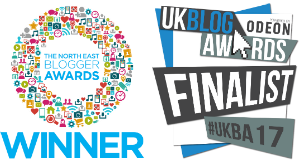 Louise calls it their ’50 year old overnight success story’! Part of the reason for this success has been the sustainable credentials of their food. One of Louise’s first tasks on joining the company was to carry out a carbon audit of their products, a sort of x-ray of their supply chain. She explained how Quorn wanted to be confident about the environmental claims they were making so chose to carbon footprint their key products. Importantly, the work was then certified by the Carbon Trust which gave them the confidence to claim that Quorn has a 75% lower carbon footprint than chicken, and 90% lower than beef. Similarly, the water footprint of Quorn is 10 times smaller than that of beef. In terms of land use, making 1kg of Quorn requires less than 2kg of wheat, whereas producing 1kg of beef takes 12-24kg of feed. This helps to explain the shocking statistic that over 70% of global agricultural land is used for livestock production. Such a profligate use of energy, water and land by animal agriculture is unsustainable now, let alone in the context of a growing global population. After a wide ranging discussion with Louise (she’s watched even more sustainability documentaries than I have! ), I was shown around the factory by Production Line Manager Mark Botterill. After donning white shoes, blue plastic overshoes, white coat, ear plugs, and hair net, I was finally allowed onto the factory floor. Although the fermenting process takes place on Teeside, where the Mycoprotein is produced as a paste, the Stokesly factory is where the food is mixed, seasoned, shaped and cooked into the products that I recognise. Mark explained the process as I watched the labyrinth of stainless steel machines and conveyors making Peppered Quorn Steaks and Bacon-style Slices. A third factory in Norfolk is where the products are packaged up for distribution to 15 countries globally. Back in the office I talked to Louise about their aspirations. They’re continuing with their carbon monitoring and have improved their carbon efficiency up to 15% over the first two year cycle. They’re working with WRAP to reduce food and packaging waste and the Stokesley factory boasts zero waste to landfill. 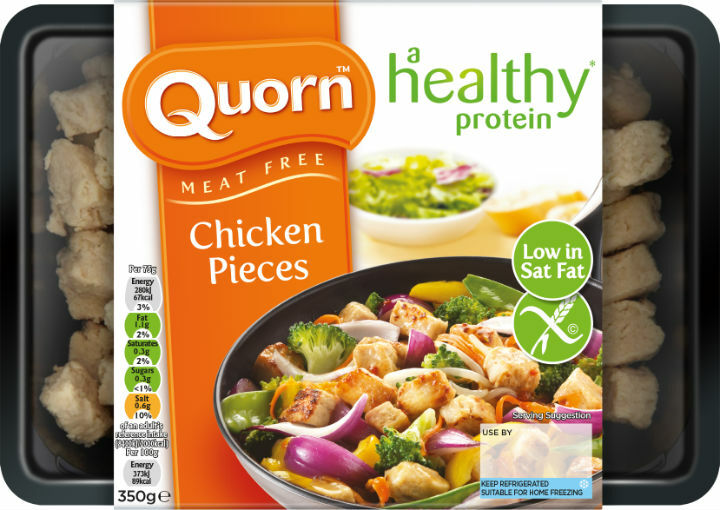 They’re liaising with the food service industry to raise the profile of Quorn as a more healthy and sustainable alternative to meat, whilst working with their supply chain to restrict the use of palm oil. Finally, they’ve recently launched a new vegan range to help people wanting to cut out all animal products from their diet. This leads us on to the question of how much meat we should be eating. I’m not convinced that removing meat from your diet for one day each week will have the positive impact that we need. Cowspiracy proposes that the real solution to climate change is to stop eating meat and dairy altogether, but that’s a significant lifestyle change for most. 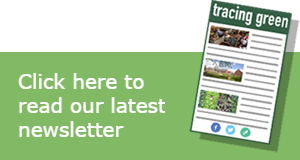 However, a recent UK government report on food security suggested that meat be promoted as an occasional treat rather than an everyday staple. If you’re planning to make New Year’s resolutions, then I think that’s a pretty good place to start, because cutting your meat consumption is the easiest way to reduce your impact on the environment.